Soft Food for Elderly. easy to chew food for senior citizens. Easy to chew or soft foods can be a boon for the elderly who have difficulty chewing due to loss of teeth. It is important that they continue to consume nutritious and balanced meals to remain active and healthy. The best soft foods are those that are soft and moist in their natural form, they can also be mashed, puréed or moisture can be added to make food easier to chew. 4 important points for senior citizens to chew food. 1. Choose fruits that are naturally soft such as banana, all types of berries such as strawberry, raspberry, chickoo, pear that can be chewed without any problem. Banana, muskmelon, watermelon, strawberries can be added to milkshakes and smoothies. Try Strawberry Yoghurt or banana apple smoothie recipe which can be had for breakfast. 2. Choose soft and moist foods. You can chop, mash, mince, grind or purée foods to give it an easy-to-chew texture. Curd Rice and Bajra Khichdi are great if your looking for good rice options that are nutritious and can be eaten without much hassle. 3. Include soups and broths that contain vegetables such as spinach, potatoes, onions, tomatoes and carrots. For nourishing soups choices, try Quick Vegetable Broth and Green peas carrot and cauliflower soup. 4. Cereals such as oats, rice, jowar, ragi, can be consumed in the form of porridge or khichdi Jowar and Vegetable Porridge is sure to keep you full for a long time. Remember to add chopped and boiled veggies in your porridge to make it nutritious and fiber rich. Enjoy our Soft Food for Elderly. 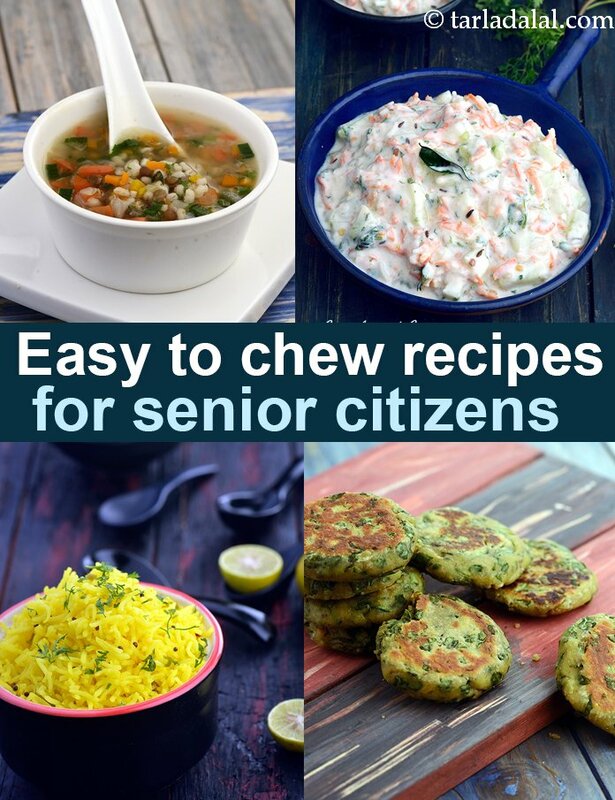 easy to chew food for senior citizens and senior citizen recipe articles below.